A myHT Fortress: Clone Wars! Friday night -- opening night -- Ben and I went to see Star Wars: The Clone Wars. Way cool! 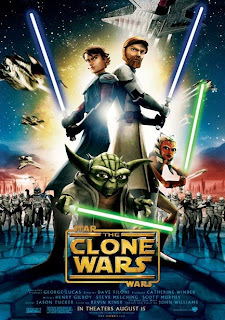 This story takes place between Episodes II and III, as the Clone Wars are at their peak. I remember 30 years ago, having no clue what the Clone Wars were about, but they sounded so mysterious and intriguing! I loved it. Great adventure. You actually get drawn into liking Anakin a bit more, so that you care for this poor soul who would end up so "twisted and evil." Rachael Soyk Erdman has a review that will be posted on Higher Things tonight or tomorrow. Look for it!